Production is a process of combining various material inputs and immaterial inputs (plans, know-how) in order to make something for consumption (the output). It is the act of creating an output, a good or service which has value and contributes to the utility of individuals. Economic well-being is created in a production process, meaning all economic activities that aim directly or indirectly to satisfy human wants and needs. The degree to which the needs are satisfied is often accepted as a measure of economic well-being. In production there are two features which explain increasing economic well-being. They are improving quality-price-ratio of goods and services and increasing incomes from growing and more efficient market production. In order to understand the origin of economic well-being, we must understand these three production processes. All of them produce commodities which have value and contribute to well-being of individuals. Economic well-being also increases due to the growth of incomes that are gained from the growing and more efficient market production. Market production is the only production form which creates and distributes incomes to stakeholders. Public production and household production are financed by the incomes generated in market production. Thus market production has a double role in creating well-being, i.e. the role of producing goods and services and the role of creating income. Because of this double role market production is the “primus motor” of economic well-being and therefore here under review. In principle there are two main activities in an economy, production and consumption. Similarly there are two kinds of actors, producers and consumers. Well-being is made possible by efficient production and by the interaction between producers and consumers. In the interaction, consumers can be identified in two roles both of which generate well-being. Consumers can be both customers of the producers and suppliers to the producers. The customers’ well-being arises from the commodities they are buying and the suppliers’ well-being is related to the income they receive as compensation for the production inputs they have delivered to the producers. The interests of these stakeholders and their relations to companies are described briefly below. Our purpose is to establish a framework for further analysis. The customers of a company are typically consumers, other market producers or producers in the public sector. Each of them has their individual production functions. Due to competition, the price-quality-ratios of commodities tend to improve and this brings the benefits of better productivity to customers. Customers get more for less. In households and the public sector this means that more need satisfaction is achieved at less cost. For this reason the productivity of customers can increase over time even though their incomes remain unchanged. The suppliers of companies are typically producers of materials, energy, capital, and services. They all have their individual production functions. The changes in prices or qualities of supplied commodities have an effect on both actors’ (company and suppliers) production functions. We come to the conclusion that the production functions of the company and its suppliers are in a state of continuous change. 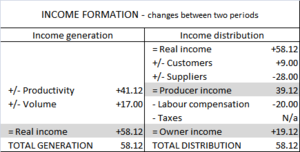 The incomes are generated for those participating in production, i.e., the labour force, society and owners. These stakeholders are referred to here as producer communities or, in shorter form, as producers. The producer communities have a common interest in maximizing their incomes. These parties that contribute to production receive increased incomes from the growing and developing production. The well-being gained through commodities stems from the price-quality relations of the commodities. Due to competition and development in the market, the price-quality relations of commodities tend to improve over time. Typically the quality of a commodity goes up and the price goes down over time. This development favourably affects the production functions of customers. Customers get more for less. Consumer customers get more satisfaction at less cost. This type of well-being generation can only partially be calculated from the production data. The situation is presented in this study. The producer community (labour force, society, and owners) earns income as compensation for the inputs they have delivered to the production. When the production grows and becomes more efficient, the income tends to increase. In production this brings about an increased ability to pay salaries, taxes and profits. The growth of production and improved productivity generate additional income for the producing community. Similarly the high income level achieved in the community is a result of the high volume of production and its good performance. This type of well-being generation – as mentioned earlier - can be reliably calculated from the production data. 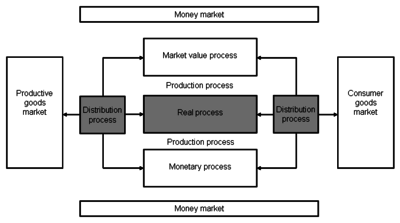 Production output is created in the real process, gains of production are distributed in the income distribution process and these two processes constitute the production process. The production process and its sub-processes, the real process and income distribution process occur simultaneously, and only the production process is identifiable and measurable by the traditional accounting practices. The real process and income distribution process can be identified and measured by extra calculation, and this is why they need to be analyzed separately in order to understand the logic of production and its performance. Real process generates the production output from input, and it can be described by means of the production function. It refers to a series of events in production in which production inputs of different quality and quantity are combined into products of different quality and quantity. Products can be physical goods, immaterial services and most often combinations of both. The characteristics created into the product by the producer imply surplus value to the consumer, and on the basis of the market price this value is shared by the consumer and the producer in the marketplace. This is the mechanism through which surplus value originates to the consumer and the producer likewise. Surplus values to customers cannot be measured from any production data. Instead the surplus value to a producer can be measured. It can be expressed both in terms of nominal and real values. The real surplus value to the producer is an outcome of the real process, real income, and measured proportionally it means productivity. Economic growth is often defined as a production increase of an output of a production process. It is usually expressed as a growth percentage depicting growth of the real production output. The real output is the real value of products produced in a production process and when we subtract the real input from the real output we get the real income. The real output and the real income are generated by the real process of production from the real inputs. The real process can be described by means of the production function. The production function is a graphical or mathematical expression showing the relationship between the inputs used in production and the output achieved. Both graphical and mathematical expressions are presented and demonstrated. The production function is a simple description of the mechanism of income generation in production process. It consists of two components. These components are a change in production input and a change in productivity. The figure illustrates an income generation process(exaggerated for clarity). The Value T2 (value at time 2) represents the growth in output from Value T1 (value at time 1). Each time of measurement has its own graph of the production function for that time (the straight lines). 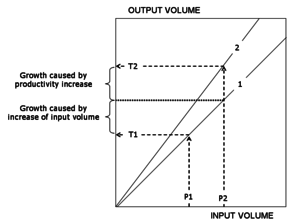 The output measured at time 2 is greater than the output measured at time one for both of the components of growth: an increase of inputs and an increase of productivity. The portion of growth caused by the increase in inputs is shown on line 1 and does not change the relation between inputs and outputs. The portion of growth caused by an increase in productivity is shown on line 2 with a steeper slope. So increased productivity represents greater output per unit of input. The growth of production output does not reveal anything about the performance of the production process. The performance of production measures production’s ability to generate income. Because the income from production is generated in the real process, we call it the real income. Similarly, as the production function is an expression of the real process, we could also call it “income generated by the production function”. Maximizing productivity also leads to the phenomenon called "jobless growth" This refers to economic growth as a result of productivity growth but without creation of new jobs and new incomes from them. A practical example illustrates the case. When a jobless person obtains a job in market production we may assume it is a low productivity job. As a result, average productivity decreases but the real income per capita increases. Furthermore, the well-being of the society also grows. This example reveals the difficulty to interpret the total productivity change correctly. The combination of volume increase and total productivity decrease leads in this case to the improved performance because we are on the “diminishing returns” area of the production function. If we are on the part of “increasing returns” on the production function, the combination of production volume increase and total productivity increase leads to improved production performance. Unfortunately we do not know in practice on which part of the production function we are. Therefore, a correct interpretation of a performance change is obtained only by measuring the real income change. A production model is a numerical description of the production process and is based on the prices and the quantities of inputs and outputs. There are two main approaches to operationalize the concept of production function. We can use mathematical formulae, which are typically used in macroeconomics (in growth accounting) or arithmetical models, which are typically used in microeconomics and management accounting. We do not present the former approach here but refer to the survey “Growth accounting” by Hulten 2009. We use here arithmetical models because they are like the models of management accounting, illustrative and easily understood and applied in practice. Furthermore, they are integrated to management accounting, which is a practical advantage. A major advantage of the arithmetical model is its capability to depict production function as a part of production process. Consequently, production function can be understood, measured, and examined as a part of production process. There are different production models according to different interests. Here we use a production income model and a production analysis model in order to demonstrate production function as a phenomenon and a measureable quantity. 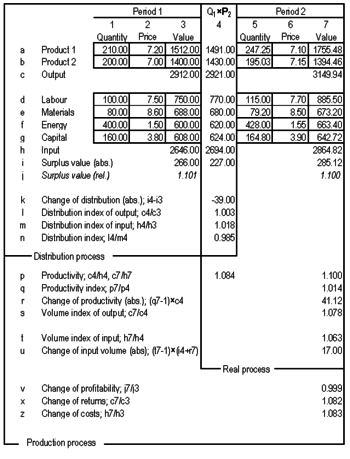 A model  used here is a typical production analysis model by help of which it is possible to calculate the outcome of the real process, income distribution process and production process. The starting point is a profitability calculation using surplus value as a criterion of profitability. 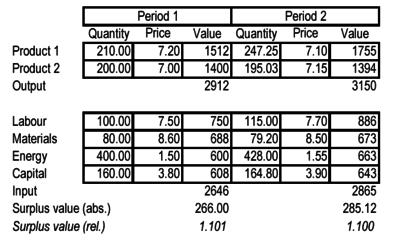 The surplus value calculation is the only valid measure for understanding the connection between profitability and productivity or understanding the connection between real process and production process. A valid measurement of total productivity necessitates considering all production inputs, and the surplus value calculation is the only calculation to conform to the requirement. If we omit an input in productivity or income accounting, this means that the omitted input can be used unlimitedly in production without any cost impact on accounting results. An efficient way to improve the understanding of production performance is to formulate different objective functions according to the objectives of the different interest groups. Formulating the objective function necessitates defining the variable to be maximized (or minimized). After that other variables are considered as constraints or free variables. The most familiar objective function is profit maximization which is also included in this case. Profit maximization is an objective function that stems from the owner’s interest and all other variables are constraints in relation to maximizing of profits in the organization. ^ "Kotler", P., Armstrong, G., Brown, L., and Adam, S. (2006) Marketing, 7th Ed. Pearson Education Australia/Prentice Hall.